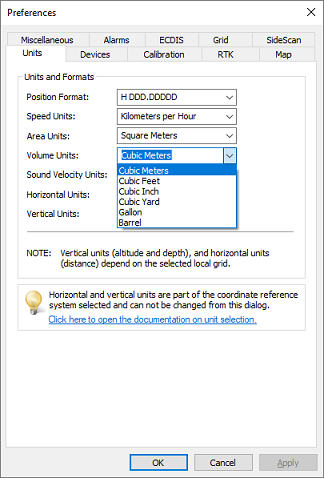 In the "Units" tab in the preferences window, you can select the desired units for speed, area and volumes. 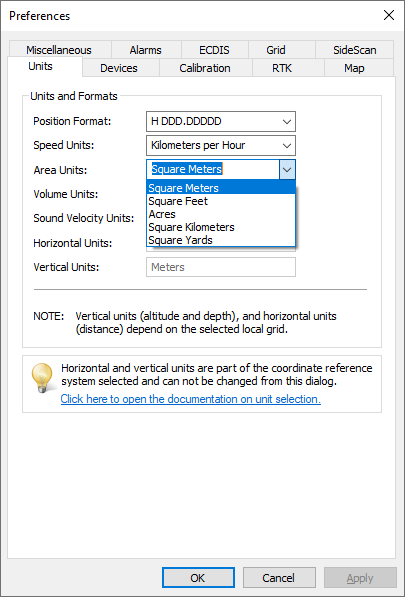 You can also find the selection for the geographic coordinates formatting here. To access the unit settings, first select the "Preferences..." item from the "Options" menu to open the preferences dialog. 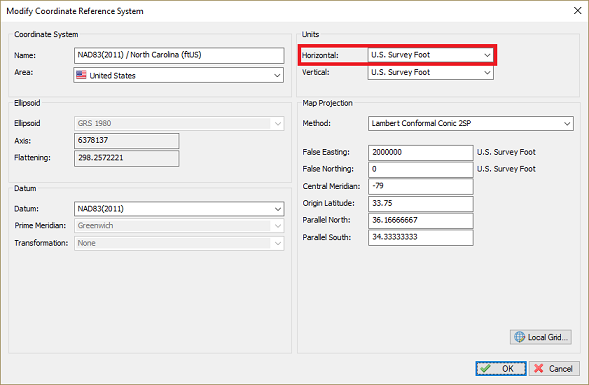 The position format defines how geographic (latitude and longitude) coordinates will be displayed throughout the software. 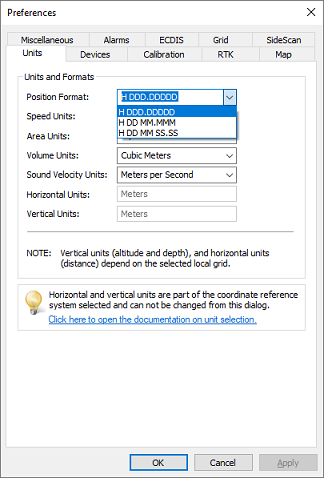 This settings will be applied to the data window, cursor position in the status bar and all dialogs which display WGS84 coordinates. Speed is displayed in the data window, but is also used in some other dialogs where speed is a factor, like the dynamic draft profile dialog. Supported units for speed are Miles per Hour, Kilometers per Hour, Knots and Meters per Second. Area's are used for instance in the area calculation tool, but also in generated volume reports (matrix, cross sections and staging volumes). 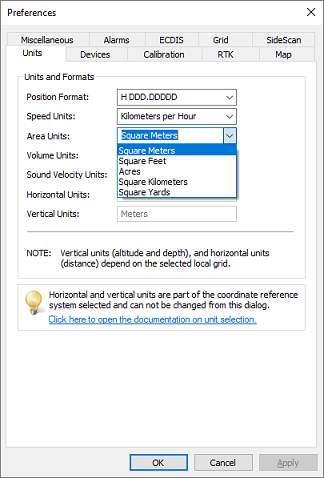 Supported units for area are Square Meters, Square Feet, Square Kilometers, Square Yards and Acres. Volumes are mainly used in generated volume reports (matrix, cross sections and staging volumes). 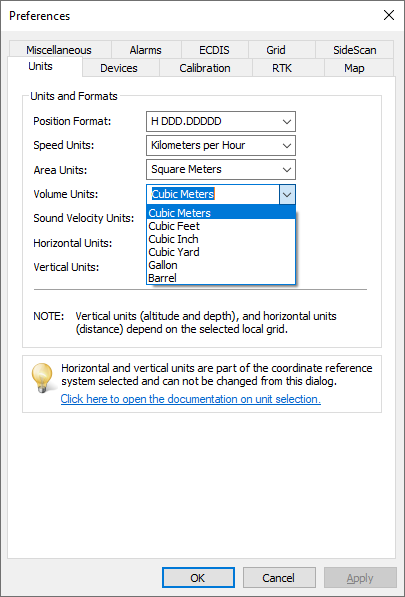 Supported units for volumes are Cubic Meters, Cubic Inch, Cubic Yard and Cubic Feet. Horizontal units are used to display easting and northing positions and will be used in distance calculations as well. 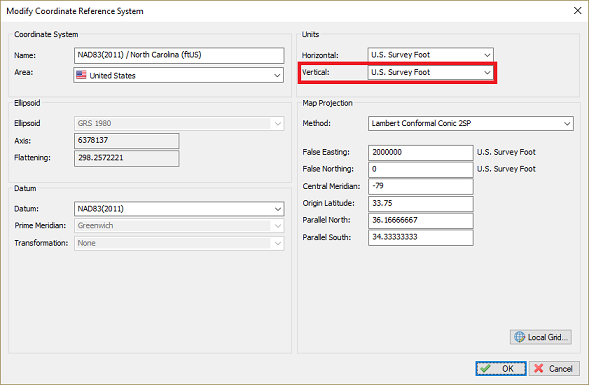 Horizontal units are part of the geodesy settings and need to be set before creating a new project. They cannot be modified here. Vertical units are used for altitude, depth, tides and elevations. Vertical units are part of the geodesy settings and need to be set before creating a new project. They cannot be modified here. Sound velocity units are used to display the sound velocity (sound of speed). 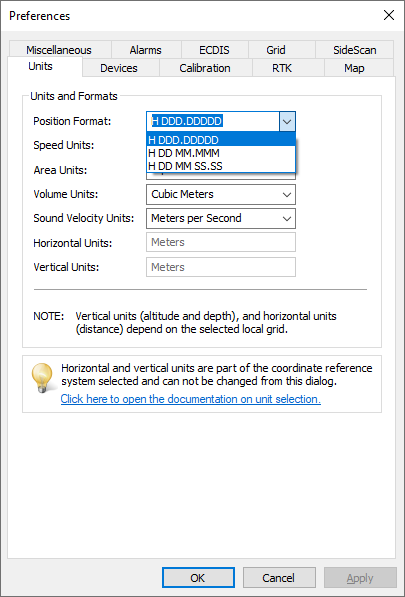 It is displayed in the data window and the sound velocity profile editor. These units are auto detected by the vertical units setting. 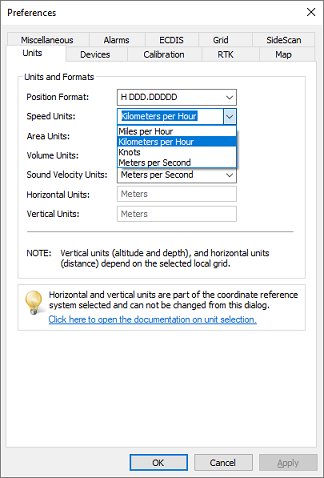 When Feet (International or U.S. Survey) is used, it will be displayed in Feet per Second, otherwise in Meters per Second.